If you have a fat or very skinny cat, you’re naturally asking yourself “How much should I feed my cat?” Do you ever worry you may be feeding your cat too much? Or potentially too little? You’re not alone and the answers to these questions might seem a bit confusing or overwhelming. But don’t worry — we’ve got you covered and will answer any questions or concerns you might have about feeding your feline friend. 3 Giving Your Cat Treats: Should You Or Shouldn’t You? 6 What About A Multi-Cat Household? 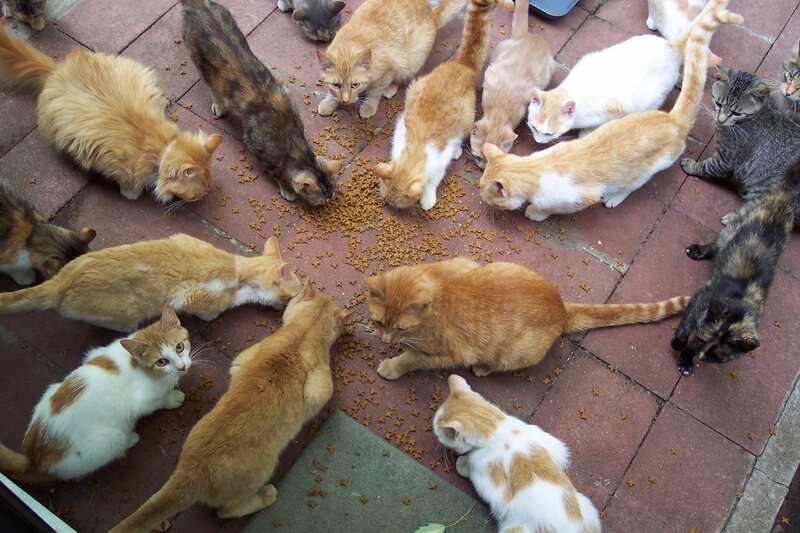 Overfeeding: Overfeeding a cat is one of the most common mistakes that cat owners make. You love them and you want to make sure that they always have food in their bowl. We understand. But it could be causing a major issue. 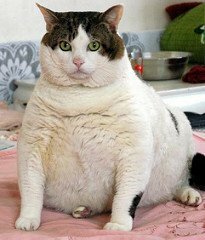 In fact, veterinarians say that obesity is the most widely seen nutritional disease in cats. It might not even mean that you’re giving them a lot of food but you could be overfeeding them based on their size and weight. Remember, cats are sedentary creatures and sleep most of the day. So, they don’t rely on too many calories to fuel their day and keep them healthy. 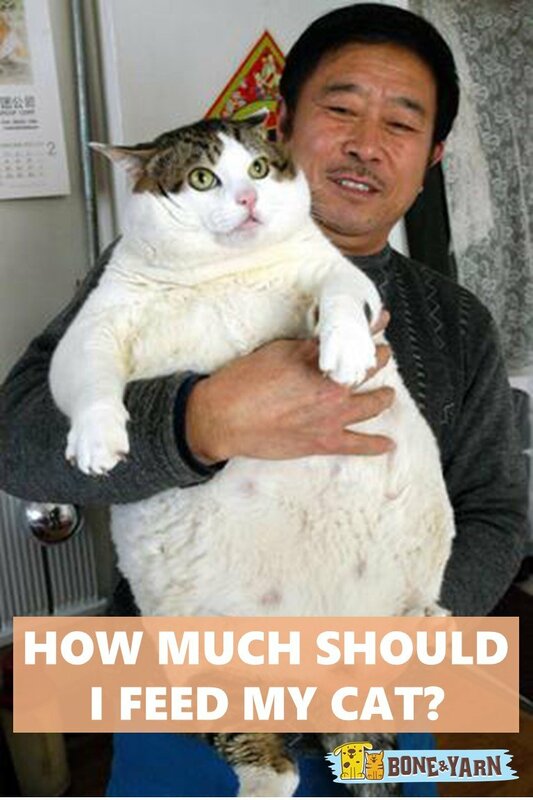 So what’s the normal amount to feed your sweet kitty cat to avoid overfeeding? The general rule is 24 to 35 calories a day per pound. The average can of wet cat food could contain anywhere from 65-240 calories in one can — for a 7lb cat, one can might be all they need for the entire day (around 210 calories needed.) Dry food is much higher in calories — ranging from 250-625 calories per cup! Make sure you’re reading the labels of the food and measure out accordingly. This will ensure that they stay at a happy and healthy weight. Creating Nutrient Deficiencies: Homemade diets for pets are on the rise nowadays, which is great! Knowing what’s going into your cat’s food gives you peace of mind and let’s you know exactly what your cat is eating. However, just because you made it doesn’t necessarily mean it’s healthy. As well-intentioned as making homemade food may be, we might not be creating the proper balance of nutrients in their food. The main balance to be aware of is the protein-to-calcium ratio. Adding meat to their diet is great! They are carnivorous creatures and thrive off of protein energy. But people often forget that in nature, the cats would have eaten the bones too, giving them the proper balance of calcium in their diet. So what can you do to make sure your cat’s homemade food is properly balanced? There are many great recipes online for homemade kitty food but the best way is, of course, to chat with your veterinarian about what’s going in the food. They can help get you on the right track. Feeding Them Dry Food Only: Feeding our cats dry food is quick and easy with no fuss at all. If you’re going to go the route of dry food, consider a few factors first. Our feline’s ancestors were hunters and would get a lot of their water through their food. For example, mice contain 70% water! 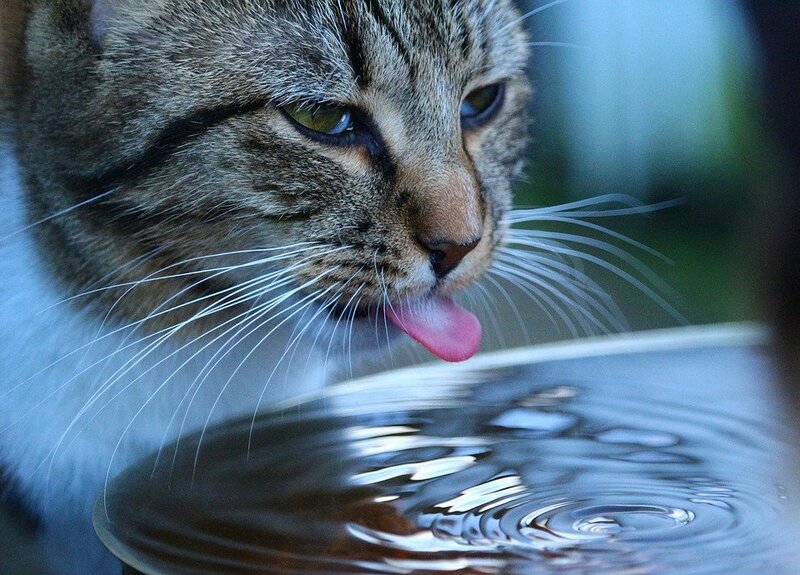 It’s important to note that cat’s have a diminished drive for thirst — unlike dogs, when dehydrated, cats are slow to initiate drinking. More times than not they will not re-hydrate themselves enough. So feeding them only dry food deprives them of their vital water intake throughout the day. It can also cause painful urinary tract problems in your cat. Cats are biologically designed to get their water via their food. Canned food does a wonderful job in aiding this process. The average can of cat food contains 78% water! So what’s the best way to make sure they’re getting the water they need? A half and half diet of dry versus wet food is a great place to start but, of course, constantly leaving fresh water around the house will encourage them to drink. Make sure to change very often. Some cats (mine included!) prefer to drink running water because, let’s face it, they can be picky — so turn on the faucet every now and again for them while they’re hanging around the sink with you. 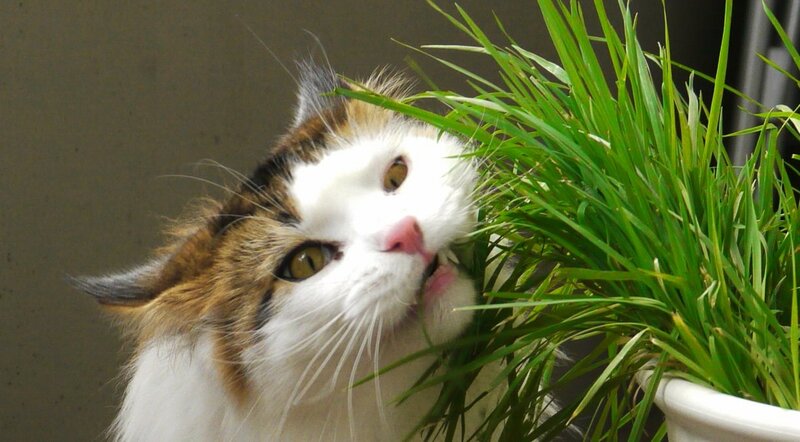 Giving Your Cat A Vegan Or Vegetarian Diet: Of course we want to make sure our cats are as healthy as can be. We want them to be with us for as long as possible! But trying to make cats vegan or vegetarian goes against our cat’s biological system. By nature, they are carnivores meaning that they thrive off of animal meat and organs. The main nutrient in meat is an amino acid called taurine which is only found in animal tissue. Taurine is absolutely vital to our cat’s health. A lack of taurine in our furry feline’s diet can lead to some serious health problems like heart problems, blindness or even worse. How can you create the best diet for your cat? Educating yourself and doing proper research will help, but once again, talking to your vet is the best way to ensure that your cat is getting exactly what they need. Now that you know some of the more common mistakes that cat owners make when feeding their food, let’s talk about some other basics when it comes to nourishing your cat. And don’t worry, if you’ve found that you are guilty of making one or two of these mistakes, we’ll make sure you have all the info you need to correct them! Just like us humans, our cats have different nutritional requirements throughout their lives. A kitten needs different food than a full-grown or senior cat. Just like a baby requires different food than an adult. Kittens require more calories than adult cats because they are expending a lot more energy playing and growing! In fact, they require almost twice the energy per pound (mentioned above in the Overfeeding section) as a mature cat. In the early weeks of their life they will need about 4 or 5 tiny meals a day. Once they reach about 6 months of age you can take it down to around two — perhaps morning and evening depending on their preference. 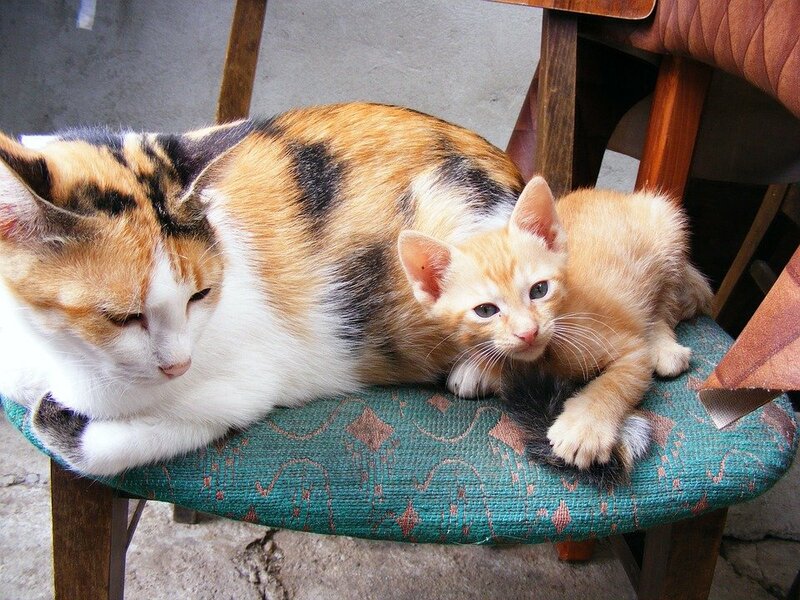 When it comes to adult cats, it will depend on their size and weight. Knowing your cat’s weight will allow you to gauge how many calories you’re giving them throughout the day. Keep in mind, if your cat is already overweight you may want to stay on the lower side of the 24 to 35 calorie per pound rule to let them lose weight safely. Giving Your Cat Treats: Should You Or Shouldn’t You? I love spoiling my cat and I am sure you do too. Pet stores these days are just littered with products advertising tasty treats for our cats with fun packaging and cute flavors. But let’s face it — the normal and balanced food you are feeding them are complete meals. They don’t need the extra calories or possibly synthetic ingredients. 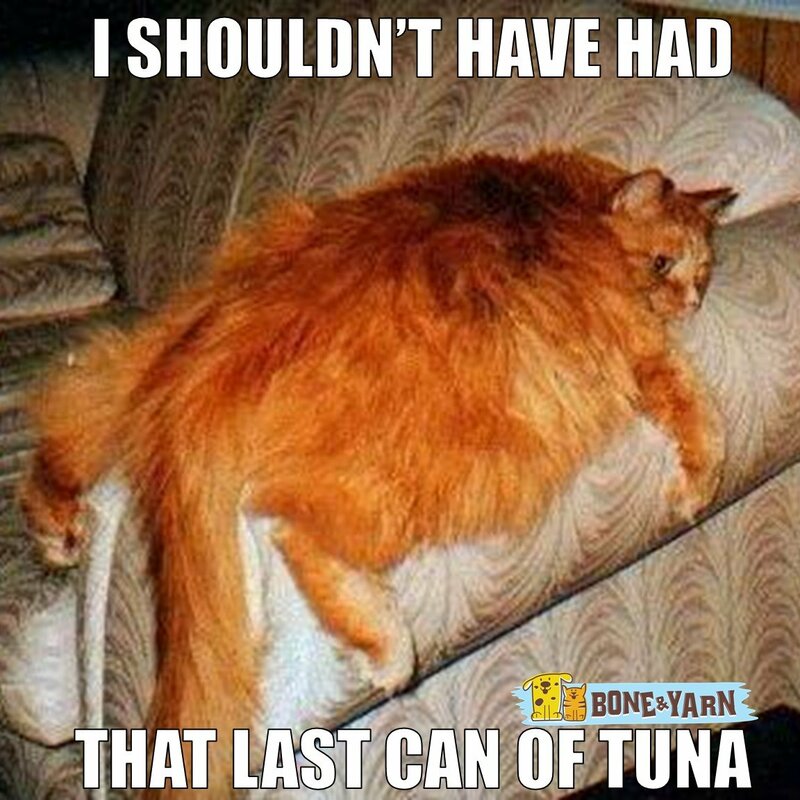 After all, obesity is a major epidemic in the feline world. If you just can’t resist giving your adorable cat a little something extra every now and again — try giving them a piece of lean protein or reduce the size of their meals throughout the day to compensate for the extra “treats” you’ll be giving them. The best way to show your cat that you love and adore them is to play with them and show them affection. A 10-20 minutes session with their favorite cat toy not only keeps them happy — but healthy too! 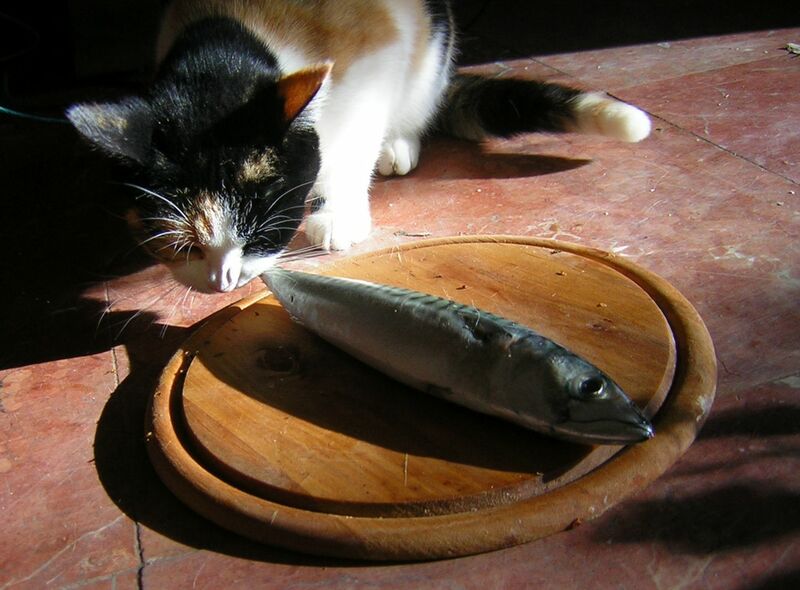 There are certain human foods that could potentially be very harmful to cats. It’s natural to want to maybe sneak them a taste of something we’re eating but it’s important to be aware of what you’re giving them — it could potentially be fatal. 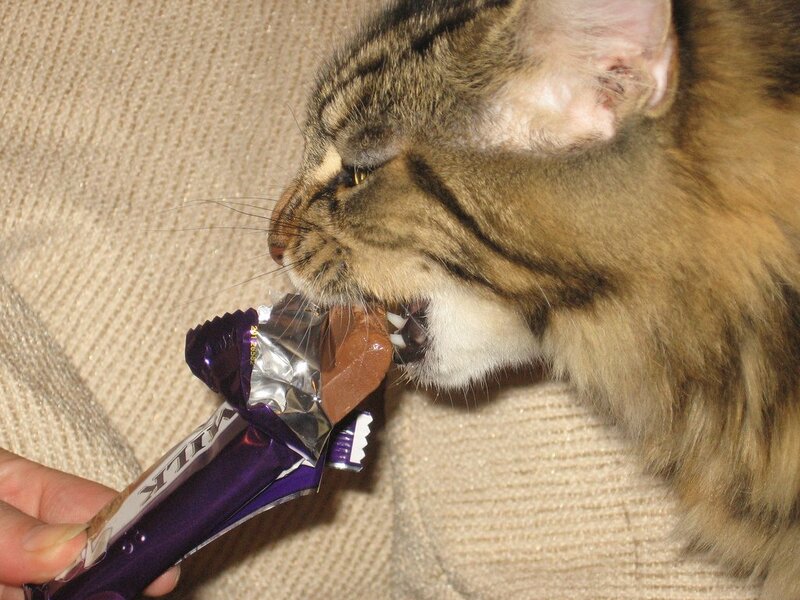 Just like dogs, cats do not tolerate chocolate — especially dark or unsweetened chocolate. It contains a chemical that could cause heart problems or seizures. So make sure to keep this treat just for yourself! Grapes and raisins may also be dangerous for your cat. They are very unlikely to even be interested in these types of things but it’s something to be aware of just in case. Ingesting such things may cause serious kidney problems. Onions can be a serious threat to your fur baby. In all forms, whether it’s raw, cooked or powdered, onions can break down a cat’s red blood cells causing anemia which doesn’t allow their blood to clot correctly. A very small dose may not be too harmful but it could lead to gastrointestinal upset which is never fun for anyone. Surprisingly, milk and cream should rarely, if ever, be given to your cat. Most people don’t know this but a majority of cats are lactose-intolerant. Their digestive system wasn’t built to handle dairy and they may end up with tummy aches and diarrhea. Again, just like humans, raw eggs shouldn’t ever be given to cats (if you’re making homemade food, keep this in mind.) The main concern is the possibility of salmonella or E. coli but there’s also another concern called avidin. Although it’s rare, a protein in raw egg whites called avidin could cause skin problems for your kitty. The answer to this question is very specific to your own cat. Earlier in the article we mentioned age but other things such as their personal health and even preference can play a role. Keep an eye out on your cat’s behavior. Just like humans, some of us just aren’t interested in eating first thing after waking up — your cat may be the same! If you notice that you feed them in the morning and they aren’t quite interested, try again in the evening and see if it makes a difference. Change the feeding schedule accordingly. Your cat’s health might play a big role as well. For example, if your cat has diabetes they may need to be on a strict regimen of feeding times or whenever they are administered insulin. This is something you’ll need to work on personally with your veterinarian. Consider your schedule as well. If you find that mornings are too hectic getting the kids to school and yourself ready for work — then you might want to create a routine where their food is placed out right after you get home or right before you go to bed. Once you find something that works for both you and your cat — stick with it and be consistent. What About A Multi-Cat Household? What’s more fun than having a few cats in one house?! There’s personality all over the place! But how do you know when and what to feed each cat? Unfortunately, there’s no easy answer to this one! Just like having kids, your cats may have different preferences or schedules. You may have to feed them separately, on different diets and in different parts of the home. Simply put — you’ll just need to come up with a plan that works. Trial and error is the best method here. Keeping our cats safe, happy and healthy are the top priorities for every cat owner and lover. There’s a lot to consider to make this all happen and make it all come together. Each cat is different and will need to be taken care of individually. Hopefully these helpful tips and information tidbits can help you get on the right track. And if it’s not listed here or you need more information? Your veterinarian is a wonderful resource for any and everything your cat may need. Pay attention to their behavior, keep them hydrated and most of all — healthy! The best way to do this is knowing what they’re eating and how much they’re eating. With all of this considered, you and your kitty will both have a long and loving life together! My Dog’s Ears Smell – What Does It Mean and What Should I Do?